One of the fundamental principles of global law is to prohibit the impunity of those responsible for serious violations of human rights. The no-impunity principle is part of the founding principles of the global community, norms of a public nature, protecting the supreme values of the world community as a whole, including the fundamental rights of individuals and peoples. The result of this Copernican Revolution of the international legal system, from states’ law to law of all humanity, from inter-state law to global law, is the development of a global constitutional process. The no-impunity principle is the basis of the International Criminal Court’s (ICC) jurisdiction. Nevertheless, deficiencies and lacunas in the implementation of this principle are evident at both the national level (due to the lack of specific regulations and at times a deliberate shutdown by state authorities) and at the international level (due to the inadequacy of international procedures to handle serious violations and punish the perpetrators). A representative example showing an absence of political will and (consequential lack of) implementation capacity of state and international authorities, in issues related to combating impunity, is the Cestaro case, where those responsible for acts of torture have gone unpunished due to the statute of limitations. In its judgment in the case, in addition to requiring Italy to pay 45,000 euros to the applicant (Article 11(2) European Convention on Human Rights (ECHR)), the European Court of Human Rights (ECtHR) asked Italy to remedy the lack of adequate criminal legislation to punish acts of torture and other inhumane and degrading treatment prohibited by Article 3 of the Convention. This measure surely enhances the effective­ness of the Court’s role in ensuring that states implement duties deriving from the constitutional norm prohibiting impunity for serious human rights violations. However, the scope of the positive obligations imposed on states by the Strasbourg jurisprudence to combat impunity for heinous crimes should be broadened. The court should do more to put an end to impunity for perpetrators. In compliance with the control function conferred on it by Article 19 ECHR and under its statement that “[t]he Convention is intended to guarantee not rights that are theoretical or illusory but rights that are practical and effective” (Airey case, para. 24), the Court would have to request Italy – in addition to the duty to adjust legisla­tion – to reopen the criminal proceedings, which had acquired the force of res judicata, to ensure the effective application of the principle of no-impunity. In such cases, reopening would give effect to the judgments of the ECtHR, meaning that “in cases concerning torture or ill-treatment inflicted by State agents, criminal proceedings ought not to be discontinued on account of a limitation period […]” (Mocanu and Others, para. 326). It is true that the case at issue does not fall within the items listed in Article 6(1) of the ECHR, which guarantees the “right to a fair trial,” thereby allowing the reopening of the proceedings. The proposed solution is based on an evolutionary interpretation of the Convention and, moreover, on the Court’s statement, which reiterated in its case law, that “[it] should take into account developments in international law […]. The Convention and its Protocols cannot be interpreted in a vacuum but must be interpreted in harmony with the general principles of international law of which they form part” (Marguš, para. 129). Indeed, the development of a global culture of no-impunity is through the emergence of a zero-tolerance response to crimes against humanity as a global constitutional principle (of which the imprescriptibility of related crimes is the inescapable logical and legal corollary which shares the nature of peremptory law). This suggests that time-barred criminal proceedings cannot be considered “fair” when disapplying fundamental human rights norms that have acquired status as “peremptory” norms, which “should be applied”. Furthermore, the premature closure of the proceedings before domestic courts due to the disap­plication of this principle implies that “the previous proceedings” would be affected by “a fundamental defect […] which could affect the outcome of the case”, thus falling under Article 4 of Protocol 7 to the Convention, which in such cases allows reopening the earlier proceedings. To also be considered is that in the Grand Chamber judgment in the Marguš case, the Court held that the ne bis in idem guarantee laid down in Article 4 of Protocol 7 to the Convention would become ineffective in cases involving crimes against humanity (includ­ing those specified in Articles 2 and 3 ECHR). States have the obligation to prosecute these crimes according to the general principle of international law that renders prescription “unacceptable” as it is incompatible with the states’ obligations to punish serious violations of human rights. In this context, it is also worth considering that states, although not obliged to, may decide to reopen proceedings to comply with the obligation in Article 46 (1) of the Convention “to abide by the final judgment of the Court in any case to which they are parties”. According to the Recommendation of the Committee of Ministers to member states No. R (2000) 2 on the re-examination or reopening of certain cases at domestic level following judgments of the European Court of Human Rights, an increasing number of states have adopted special legislation providing for the possibility of such reopenings. This is appropriate as an urgent remedy to grant reparation for impunity for those responsible for having enjoyed acts of pardon, amnesty, or prescriptions. Such a measure would constitute a further step on the difficult path towards the increasingly integrated and effective protection of fundamental human rights in global law. Featured image credit: ‘Justitia’ by Pixel2013, CC0 Creative Commons via Pixabay. Giuliana Ziccardi Capaldo is Emeritus Professor of International Law, at the University of Salerno and General Editor of Global Community: Yearbook of International Law & Jurisprudence, Series, 2001-2016, 29 volumes, Oxford University Press. 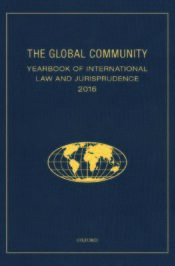 This blog post draws on material from The Global Community Yearbook Of International Law And Jurisprudence 2016, available on Oxford Scholarship Online.